It will be a long flight to the fight in Germany for Kyle Noke. 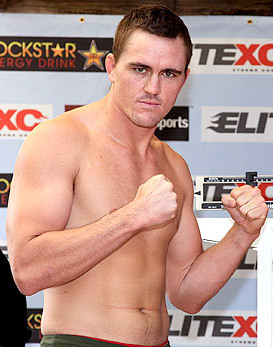 The Australian-born Kyle Noke is no newcomer to the Octagon. He bested almost tens of brawlers in his 22 MMA fights, and hopefully thinks he will again at the UFC 122. This Germany trip will be a face-off with Rob Kimmons on November 13. The enlistment of “Ultimate Fighter” cast member to the Belfort-Okami title shot was confirmed yesterday. MMA veteran Noke was spectator’s favorite to win in his season of the “Ultimate Fighter”. Though his stint in the show was short, he struck back at the season finale with a blast in 2nd round TKO win over former housemate Josh Bryant. The Aussie keeps a three-time winning streak as he dedicate himself fully to training at Grag Jackson’s camp in Albuquerque, New Mexico. He has no intention of cutting that streak short especially in November. On the other hand, opponent Rob Kimmons now handles a record of 3-2 in the Octagon. His latest victory emerged from an August bout with Steve Steinbeiss. The NOvember match-up will be his sixth UFC stint. Kimmons vs Noke will probably take up the slot on the untelevised portion of the UFC 122, as Spike TV broadcasts from Berlin via same-day delay on the United States.